Okay, so this one isn't an issue as much as a miscommunication. Despite Google's newest, premium Pixel smartphone shipping with an 18-watt USB Power Delivery 2.0 wall adapter, the phone's charging speed is capped at 10.5W. According to a test performed by Nathan K over on Google Plus, the Google Pixel 2 XL has been proven to be charging "slow". This confirms reports of many users who feel that the Pixel 2 XL was not charging at its full potential. The Pixel 2 XL comes with a wall adapter, which is advertised on Google's site, to charge the phone with up to 18W of current. 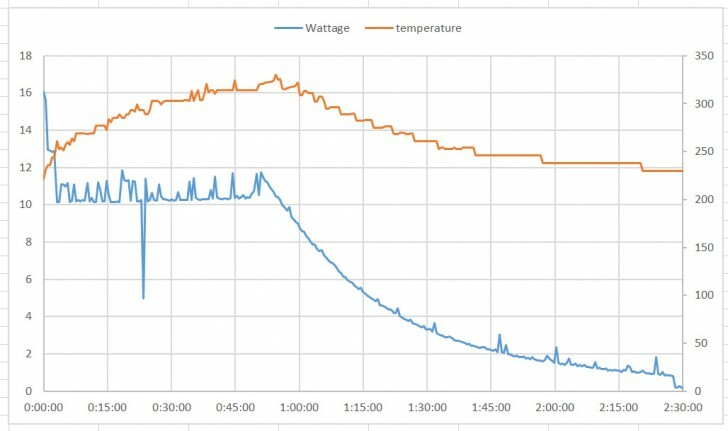 Nathan K's wattage/temperature graph is shown below. Notice how the wattage starts at about 15W in the very beginning, but quickly switches down to just over 10W in the graph. The phone continues to charge at this rate until about 50 minutes into the cycle, where it begins to gradually slow down until the very end of the cycle, where charging is completed, 2 and a half hours after starting. In our review, we usually run a test with a depleted battery as to how much capacity the included charger can restore within 30 minutes of starting. The Google Pixel 2 XL charged to 35% in 30 minutes, which was well below other smartphones in the same category, around upper 40s and lower 50s in the percentages. Several fast-charging methods switch between multiple voltages. In this wall adapter's case, the phone should charge at 9V (up to 2A) when its battery is depleted below something like 40% or 50% capacity. The Pixel 2 XL is not switching between voltages and is sticking to the single 9V and not going above 1.1A or 1.2A (around 10W). Note that this wattage is only with the included wall adapter, the phone will have to charge at the lower 5V voltage when plugged into a computer's USB port. One possible reason, according to Nathan K for the phone's charging current to be tuned so conservatively is to save the battery from the same degradation issues that the Google Nexus 6P faced. An incorrectly programmed Power Management chip on the Pixel 2 XL is an entirely plausible scenario, considering the other PR nightmares that Google has faced with the Pixel 2 XL already, including one that could face court. The original Google Pixel also had a similar situation when it charged at a maximum 15W over an advertised 18W. The smaller battery of the Google Pixel justified this difference in wattage. This is a 58% difference. Yeah with 2h and 30 min? :D simple mathematics in my opinion goes like this 1h 30m faster than 2h 30m, or I am wrong genus?